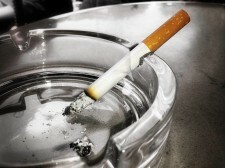 Smoking Cessation Can Tobacco Be Part Of The Solution? Turin, Italy (July 6, 2010) -- The American Council on Science and Health (ACSH) today led a panel of the world s leading tobacco and nicotine experts on science and policy in the area of Tobacco Harm Reduction i.e. how smokeless tobacco products can be used as a small backfire to put out the larger, more deadly forest fire of cigarette smoking. Reducing the deadly toll of cigarette smoking through Tobacco Harm Reduction was the subject of a session at the Euroscience Open Forum (ESOF), currently underway in Turin. ACSH s Dr. Gilbert Ross and Jody Manley have just returned from an FDA workshop on modified risk tobacco products (MRTP), which was convened as directed in the 2009 law granting regulatory authority over tobacco products to the FDA. The goal is to assess the form that such regulation will take over MRTPs such as smokeless and dissolvable tobacco, as well as electronic cigarettes (e-cigarettes). Fourteen speakers with varying degrees of expertise on MRTPs briefly presented their opinions, prior to a variety of panel discussions designed to provide the FDA with the input they need to approve marketing tobacco products that make modified risk claims. Hall of Fame outfielder Tony Gwynn is being treated for salivary gland cancer — and he’s telling reporters he suspects it was caused by his career-long use of chewing tobacco. Gwynn, 50, told the San Diego Union-Tribune he’s beginning radiation and chemotherapy for the cancer in his parotid gland, which pumps saliva into the mouth. Can smokeless tobacco products satiate a smoker’s nicotine craving while simultaneously serving as a smoking cessation aid? And if so, is it conceivable that such a transition might result in net harm, paradoxical as that seems? These are the pivotal questions that Matthew Carpenter, an associate professor in the Department of Psychiatry and Behavioral Sciences and the Department of Medicine at the Medical University of South Carolina, aims to answer with his new year-long study on 1,250 smokers nationwide. In his upcoming research, funded primarily through the National Institutes of Health, Dr. Carpenter will provide half of the study participants with Camel Snus while the other half will not be given anything. Those who support tobacco harm reduction as an effective option for reducing the terrible toll of smoking on Americans health face an uphill battle, as media coverage continues to promote misleading claims about the safety and effectiveness of harm reduction products. And so we were dismayed to read an extremely one-sided USA Today article on an upcoming FDA meeting that will discuss the safety of tobacco lozenges and strips, known as dissolvables. Teens mainly use tobacco (mostly cigarettes) to ape their older peers and feel grown-up: their older siblings and friends are not indulging in dissolvable tobacco products. Finally a bit of sound science and common sense seems to be percolating from an official governmental agency unfortunately, not in our country. The U.K.'s Cabinet level behavioral insight team, better known as the nudge unit, is encouraging the use of smokeless nicotine cigarettes to help addicted smokers quit, thus hoping to prevent tens of thousands of smoking-related deaths among Britons. Published on Thursday, the unit's first annual report states: If alternative and safe nicotine products can be developed which are attractive enough to substitute people away from traditional cigarettes, they could have the potential to save 10,000s of lives a year. University of California at Los Angeles chancellor Gene Block yesterday announced that the campus will go tobacco-free on April 22, 2013, which is Earth Day. Recommended by UCLA s Tobacco-Free Steering Committee, the ban will include all tobacco products, including electronic cigarettes and oral tobacco. UCLA Health Sciences had implemented a smoke-free policy last November, but now University of California President Mark Yudof has asked all UC campuses to follow suit by January 2014.